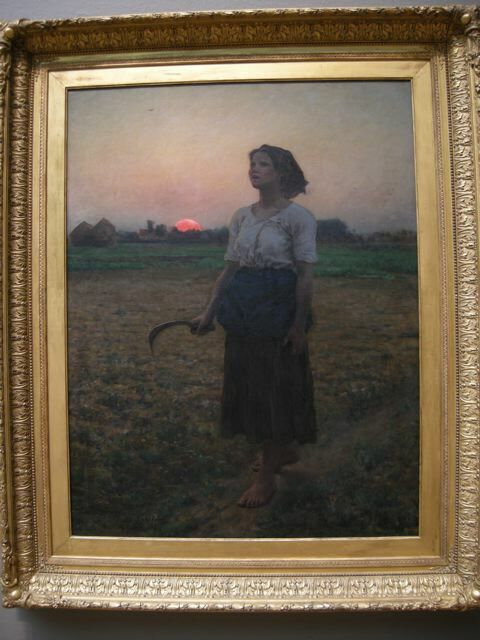 Jules Breton, Le Chant De L’alouette (Song of the Skylark),1884, oil on canvas, Chicago Institute of Art. I've uploaded an image from the net and a photo I took, framed included, from 2008. 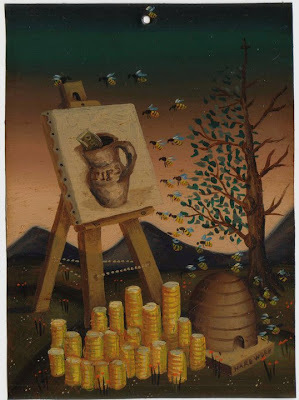 I've just completed varnishing, 'antiquing' and archiving thirty-two new retablos and ex-votos from December/ Jan. The majority of the paintings are small oils on metal, approx 125mm x 90mm and seem to be assessing my new American environment and art scene. I've been keeping to smaller works to keep a balance of confidence and development as I've really just come to understand the gravity of our recent move to the USA and how daunting it really is. I've been looking back at some of my painting from 2003 to 2008 where my work shifted focus from NZ to the USA and popular culture, whilst trying to assess how narrative art from the Renaissance has been transformed into the narration of popular culture. When I first arrived in the USA in July, I was treading water and repeating works that I'd done in 2003/2004 to find an equalibrium to help me make the adjustments to living in a new country. After 5 months of painting, this new series of small works, I think, hold the key to my assessment and assimilation into the new country. Useful talismans/heirlooms indeed. Painting problems. Usually, I can solve issues with paintings (the issues, if explained, would seem nonsensical and ridiculous, so i'll just say they're 'issues') through drawing - developing sketches and doodles from the original invention/drawing. Sometimes it's along time which helps resolve the problem. Time allows for clarity. But sometimes in a particularly tricky painting, such as the one below, I want it to be something that it is not. 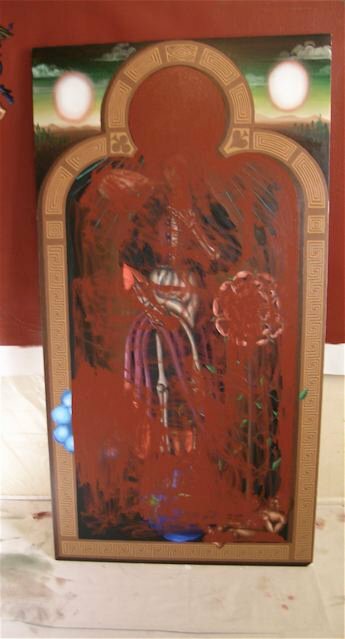 That is, an older painting from 2008 called 'Big Garden'. I painted Big Garden after returning from a 5 month trip around the USA and Europe. 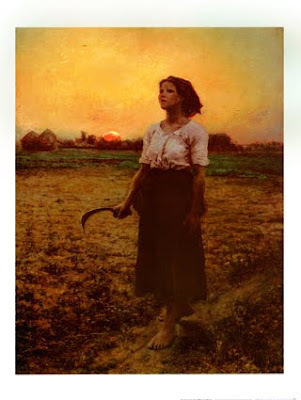 I actually started this blog on returning to NZ and you can see the painting in development in some of the early photos (that's Big Garden on the ground by Jo). That painting took 4 days to paint, without any prior drawings or sketches. I just knew what and how it needed to be painting. The work below that I've been nursing for 3 months and been through 3 incantations now and I've just painted over the third. I now saw what needs to come out of this painting and to involve the spirit of the original 'Big Garden' I'm going to attack the painting without any prior sketches and develop it in the canvas.